Inclusive and diverse learning environments are ones in which students feel that their contributions and perspectives are equally valued and respected. As Cal Poly works to increase the diversity of its faculty, staff, and student populations as well as create a more inclusive campus climate, instructors must understand the needs and behaviors of a broad range of students and develop techniques for working effectively with them and preparing them for employment globally. See the pages listed on the menu at the right for ideas and strategies on how to create and maintain inclusive and diverse classrooms. Below is a listing of various programs and services. One of the important ways that Cal Poly educators can help all students to be successful is to foster a class environment that is conducive to learning by establishing core commitments to inclusion and support of diversity. There are a number of ways to do that, but one rather brief but potentially effective way is for faculty to convey their personal and professional values for diversity and inclusion directly and clearly to students through a syllabus statement. 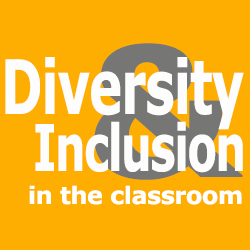 The page linked below provides guidance, resources and examples of inclusion statements, which can be incorporated into syllabi. The inclusion statement language can also be useful whenever faculty recognize the need to restate their personal and professional support for inclusion and diversity. These reminders would be timely whenever incidents in class, on campus, or elsewhere might undermine students' sense of inclusion and belonging at Cal Poly. Creating a more diverse, equitable, and inclusive campus is the responsibility of all campus community members, including faculty. This professional development opportunity is designed for Cal Poly educators who seek to incorporate inclusive teaching practices and infuse diversity principles into their teaching consistent with the campus’s Diversity Learning Objectives (DLOs). The program contributes to progress on two of Cal Poly’s university-wide diversity imperatives: (1) “enhance [the] campus climate” and (2) “exemplify inclusive excellence in Learn by Doing, scholarship, teaching, and learning.”Faculty participation in this program can help departments and colleges make progress on their diversity, equity and inclusion goals and contribute to a more inclusive campus community. This is the fourth year for this program, which launched in 2016 as a collaboration of the CTLT and the Office of University Diversity and Inclusion (OUDI).